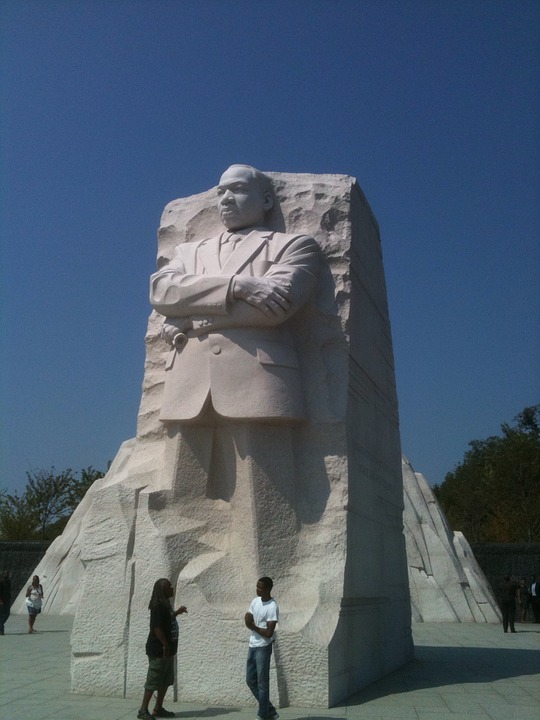 The Martin Luther King Jr. Memorial is located in West Potomac Park next to the National Mall in Washington, D.C., United States. 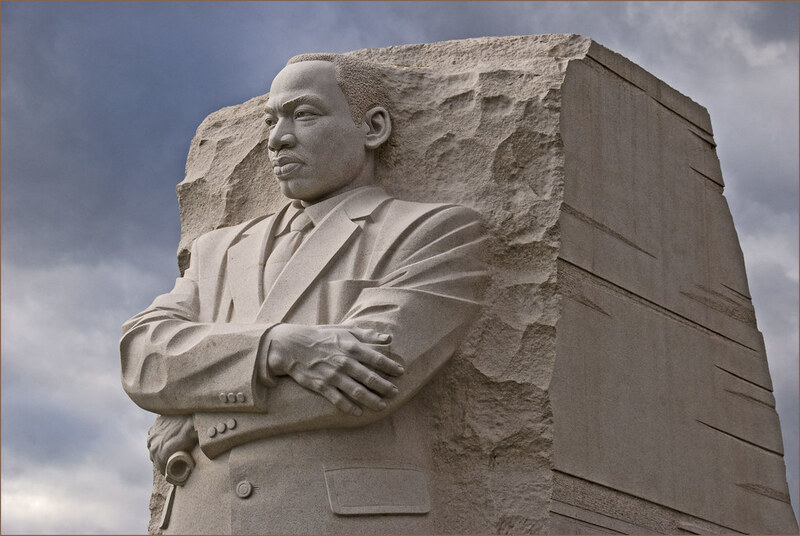 It covers four acres and includes the Stone of Hope, a granite statue of Civil Rights Movement leader Martin Luther King carved by sculptor Lei Yixin. The inspiration for the memorial design is a line from King's "I Have A Dream" speech: "Out of the mountain of despair, a stone of hope." The memorial opened to the public on August 22, 2011, after more than two decades of planning, fund-raising, and construction.This national memorial is the 395th unit in the United States National Park Service. The monumental memorial is located at the northwest corner of the Tidal Basin near the Franklin Delano Roosevelt Memorial, on a sightline linking the Lincoln Memorial to the northwest and the Jefferson Memorial to the southeast. The official address of the monument, 1964 Independence Avenue, S.W., commemorates the year the Civil Rights Act of 1964 became law.A ceremony dedicating the memorial was scheduled for Sunday, August 28, 2011, the 48th anniversary of the "I Have a Dream" speech that Martin Luther King Jr. delivered from the steps of the Lincoln Memorial in 1963 but was postponed until October 16 (the 16th anniversary of the 1995 Million Man March on the National Mall) due to Hurricane Irene.Although this is not the first memorial to an African American in Washington, D.C., King is the first African American honored with a memorial on or near the National Mall and only the fourth non-President to be memorialized in such a way. The King Memorial is administered by the National Park Service (NPS). A beautifully serene place to visit. The Dr. King Memorial provides a wonderful backdrop for reflection. This was my third visit and most certainly not my last. On a nice spring day, I recommend visiting the African American Smithsonian Museum. Then leisurely walking to the Dr. King Memorial. This memorial is honestly grand! Its great to be honouring a national figure in such a great way. The rocks are all so big and the amount of precision and effort and time put into it is very visible. And the view onto the water is also very great, though the sidewalk around it is often flooded, you van take some great pictures there, especially with the blossom trees. Great place and definitely something you wouldn't want to miss when going to Washington DC! One of the most amazing memorial it is!! There are a lot of people here, and many students and families are here to visit. Here I have the opportunity to see the home of Martin Luther's childhood (I think I should come here very early in the morning so that I can join the guided tour, they will soon be full), and he and him The church where Dad prayed, and other places about his youth, there is also an information center to introduce his work in the civil rights movement. Who would give this place less than 5 stars? I mean come on. It's a beautiful sculpture of a great man.